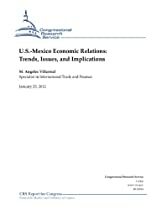 The bilateral economic and trade relationship with Mexico is of interest to U.S. policymakers because of Mexico’s proximity to the United States, the high level of bilateral trade, and the strong cultural and economic ties that connect the two countries. Also, it is of national interest for the United States to have a prosperous and democratic Mexico as a neighboring country. Mexico is the United States’ third-largest trading partner, while the United States is, by far, Mexico’s largest trading partner. Mexico ranks third as a source of U.S. imports, after China and Canada, and second, after Canada, as an export market for U.S. goods and services. The United States is the largest source of foreign direct investment (FDI) in Mexico. The 112th Congress will likely maintain an active interest in Mexico on issues related to cross-border trade between the two countries, the implementation of NAFTA trucking provisions, economic conditions in Mexico, migration, counternarcotics, and border issues. The United States and Mexico have strong economic ties through the North American Free Trade Agreement (NAFTA), which has been in effect since 1994. Prior to NAFTA, Mexico had followed a strong protectionist policy for decades until it began to unilaterally liberalize its trade regime in the late 1980s. Not all trade-related job gains and losses since NAFTA can be entirely attributed to the agreement because of the numerous factors that affect trade, such as Mexico’s trade liberalization efforts, economic conditions, and currency fluctuations. NAFTA may have accelerated the ongoing trade and investment trends that were already taking place at the time. Most studies show that the net economic effects of NAFTA on both countries have been small but positive, though there have been adjustment costs to some sectors within both countries. The trade issue of most concern to Members of Congress over the past several years involves NAFTA trucking provisions. Under NAFTA, Mexican commercial trucks were to have been given full access throughout the United States by 2000 but the United States did not implement these provisions due to alleged safety concerns. Mexico objected and a NAFTA dispute resolution panel supported Mexico’s position in 2001. In 2009, the Mexican government began imposing retaliatory tariffs on certain U.S. products with a value of $2.4 billion in exports to Mexico. On July 6, 2011, the United States and Mexico signed a Memorandum of Understanding to resolve the dispute and a new pilot program was announced by the Federal Motor Carrier Safety Administration. Mexico eliminated 50% of the retaliatory tariffs in July 2011 and the remaining 50% in October 2011. Also of interest to many policymakers is the economic disparity between the two countries and migration issues. The United States and Mexico have been involved in ongoing efforts to address economic prosperity and regulatory economic cooperation. In 2009, President Barack Obama met with Mexican President Felipe Calderón and Canadian Prime Minister Stephen Harper in Guadalajara Mexico to discuss issues of prosperity and security in North America. In May 2010, Mexican President Calderón made a state visit to the United States in which he emphasized the need for increased cooperation in North America to increase the competitiveness of the region. In a meeting hosted by President Obama, the two leaders reaffirmed their shared values and the need for focusing on economic growth. They vowed to enhance and reinforce efforts to create jobs, promote economic recovery and expansion, and encourage prosperity across all levels of society in both countries. President Obama underscored his commitment to comprehensive immigration reform in the United States while President Calderón stated that his administration was committed to creating more job and educational opportunities in Mexico.